We celebrated Thanksgiving last weekend with friends in Cologne, and they treated us to a very traditional meal: turkey, mashed potatoes and gravy, green beans, cranberry sauce, … It was really lovely. So when Thanksgiving Day rolled around, we just came home and had a simple dinner. We had a chance to chat with a bunch of my extended family online, too. They were gathered for our family’s traditional late lunch, so when my brother called he was quickly joined by a smattering of aunts, uncles, and cousins. I’m incredibly grateful for my friends here, but there’s nothing like seeing family on a major holiday. Yesterday, the Christmas market opened. (As my brother put it, Thanksgiving is only celebrated in the US, but Black Friday is celebrated everywhere.) On my way to my German class, I stopped and browsed some of the vendors’ stands, smelled the good food, and wished that I were able to stop and have a glass of Glühwein. I’m looking forward to spending a little more time at the market in the coming weeks. It’s so lovely to see the city decorated for the holidays. We stopped for dinner at a nice Indian restaurant, Tandoori (Karlsgraben 37). We have been there a few times now, and every time the atmosphere has been comfortable and the food has been very tasty. I appreciate having good Indian and Thai food around for those times when I feel like the food around me is getting too bland. You really can find spicy food around here! Today I had another “American” experience, this time at the grocery store. As I browsed some of the frozen food, the word Amerikaner caught my eye. 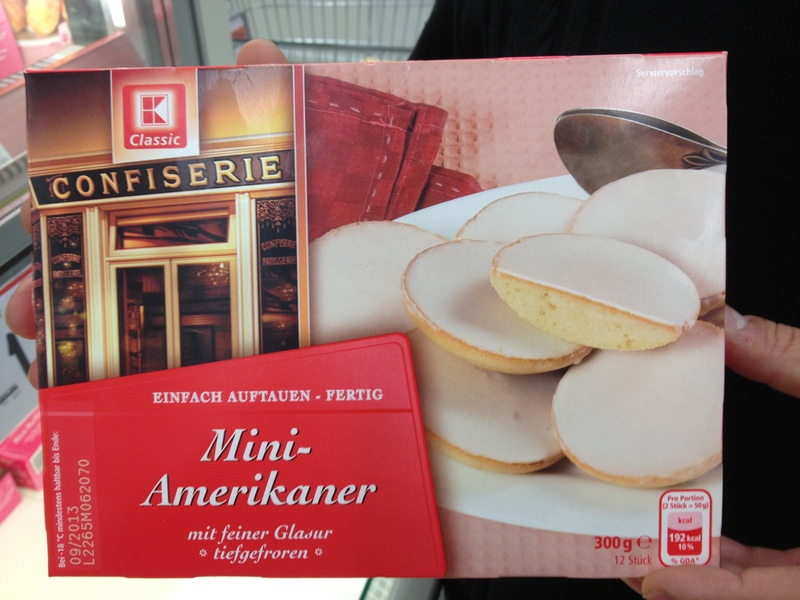 I looked at the box, labelled “Mini-Amerikaner,” and tried in vain to make a connection between the picture of white-glazed, dome-shaped baked goods and any American sweet I could imagine. I had to look it up when I got home: Apparently the term Amerikaner is used for Black and White Cookies, although here they usually only have white icing. It’s hilarious to see what elements of American culture are picked up and marketed over here!